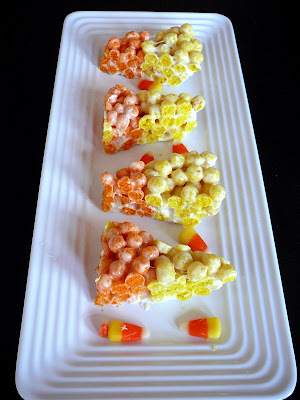 This is the last of my cereal recipes that I made for Betty Crocker. I wanted to dip the tips of these little guys in white chocolate, but they were the last of five things I baked that day and just did not have the energy. I think they are cute without the white tip, but if I make them again I will definitely dip them. 1) In a saucepan, melt 1 tablespoon butter and 12 marshmallows over low heat, stirring occasionally until completely melted. Remove from the heat. Add 2 cups of orange colored Trix cereal and stir until completely coated. 2) Using a greased spatula, evenly press mixture along one side of the prepared pan. 3) Repeat step one with the yellow Trix. Using a greased spatula, evenly press mixture along the row of orange Trix. 4) Cool completely and cut into triangles. 5) If desired, dip tips of triangles in white chocolate. Place on wax paper to cool.